Conversion Allowed in Zoroastrianism ? The very learned, respected, religious & pious late Vada Dasturji Kaikhushroo Jamaspasa (Grandfather of the current Vada Dasturji K. M. Jamaspasa) of the Anjuman Atash Behram had converted a French lady (Suzanne) from Christianity to Zoroastrianism by performing her Navjote & had also solemnized her marriage with Ratanji Dadabhoy Tata (parents of JRD Tata), as per the Zoroastrian rites in 1903. Please note that the navjote ceremony for conversion of the French lady to Zoroastrianism was carried out not by any ordinary common priest BUT was performed by the Vada Dasturji Jamaspasa himself. This great Vada Dasturji is our current Vada Dasturji’s own grandfather. He was forthright, acted as per our scriptures & “Practiced what he Preached” and never succumbed to the undue pressure from the Talibans of our community. da Dasturji Jamaspasa’s own grandfather. The late Vada Dasturji Kaikhushroo Jamaspasa was a highly learned, religious & pious High Priest. This late noble Dasturji had done the right thing, as mentioned in our scriptures and had never cowed down to the pressure from the so-called orthodox. We salute him for taking a bold, fearless & right step. Earnestly wish if the current High Priests could take such a courageous stand, as mentioned in our holy scriptures. Attached is the text letter addressed to the BPP by Vada Dasturji Kaikhusroo Jamaspasa, wherein he clearly states that “there is no bar in our religion, to accept non-Zoroastrian converts”. It was also published in Jame Jamshed & Mumbai Samachar some years back. This letter was written to the BPP in 1903, that is cool 107 years back, and till date no one, either from the BPP or from the orthodox have been able to prove from our scriptures, that what Vada Dasturji Jamaspasa mentioned & stated in his letter was not correct. Please forward this to as many as possible. I AM AGAINST CONVERSION OF ANYONE IN OUR GREAT RELIGION !!!! WE’D RATHER GET EXTINCT THAN CONVERT ANYONE INTO A ZOROASTRIAN….NO !!!!!!! NOT AT ALL !!! Perhaps your narrow version will go extinct and the old, true faith will take its place. Start a terrorist group, Zoroastrian Taliban, or prove that conversion is not allowed. Hi Hoshi, I am a 45 years old Jew woman. I have read your post and I honnestly can understand your need, your necessity of Purity because it is an Ideal and Zoroaster (as far as I understand ) teatches that Ideal comes to Reality… But listen :: this world IS corrupted, that you/we want it or not. You say “we’d rather get extinct that convert ANYONE into a Zoroastrian” -Why not to do this : a very ultra selective conversion. So that your community keeps all in its hands and power of decision. There is a big difference between muslims or christians or even bouddhists that a proselyth and convert anyone no matter who – and jews (by exemple) where you need to go through a long process supervised by a community of priest and representants of laymens until they accept you as worthy to be one of them. As a conter-exemple, I also give you the case of my husband’s people. He is Native American / First People of America. As you know all these People were genocided by the anglo-spaniard invasion of the Americas. Now, what happens : the majority of the people left hav lost much of their spirituality and try to rediscover it as they can. BUT in the same time, the new-agists/ white in majority pretend to know about their religion and de-nature it by doing false ceremonies and approximative role-plays. Why ? Because nothing was codified, decided, because no one is there to say : “This is what is Native Amercian Spirituality”. So it is an american anarchy and this really makes the true spirituality weak and lost. So, really, think about the possibilities of your Religion. Because you say “rather get extinct that convert anyone(…)”. Imagine now : if you are extinct, anyone could come and play the Zoroastrian and pretend it to be true without any one to contradict. I hope Zoroastrianism will live and evolve in its beauty and purity. Do u mean that our Great Lord Ahuramazda do not accept me to follow his wishes and to follow the beh din way? Do u really realize what do u say? Ahuramazda say no to me becuase I honour him. When Zarathustra descended from the mountain after his meditative chat with Ahura Mazda, his first words were ” I have brought this knowledge FOR ALL OF MANKIND”. How can the present ‘SO CALLED’ orthodox custodians of the Zoroastrian faith not understand the meaning of “FOR ALL OF MANKIND” ? Do people of other faiths belong to the animal kingdom ? The present trustees of the BPP have just taken the cue from the BJP who came to power at the center playing the religion card. Well done. I have been of the same opinion, arguing with all our so called staunch parsees that when Zoroastra started preaching our religion he had converted people into zoroastranism as before that there were no parsees. Therefore it is not right to state that conversion is not allowed in our religion. The following article proves the hollowness of claims of BPP & WAPIZ. We challenge BPP<WAPIZ< & ALL WADA DASTURS TO REFUTE THE FOLLOWING FACT. IF THESE PEOPLE CAN ISSUE FATWAS FOR DASTURS LIKE MADON & MIRZA FOR DOING THE SAME ACT AS DONE BY LEARNED DASTURS OF THE PAST. WHY EXEMPT SANT DR. KUKADARU SAHEB & Dastur Jamaspji Minocherji Jamaspasana ( GRANDFATHER OF PRESENT WADA DASTUR) & OTHERS? LET US SEE HOW ORTHODOX THESE DHONGIS ARE ? KINDLY FORWARD THIS MAIL TO ALL YOUR ZOROASTRIAN FRIENDS ON YOUR MAILING LIST. Sant Dasturji Kukadaru Saheb performed Navjotes of persons of inter-married parentage. Saint Dasturji Jamshedji Sorab Kukadaru (1831–1900) needs no introduction to the Parsi community. 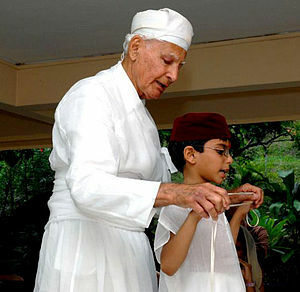 His portrait adorns all the Agiaries, Atash Behrams & practically all the Parsi homes. He was the panthaky of the Kapawalla Agiary. He led a simple life of ashoi (righteousness), quite unlike most of the present day Panthakies, who lead a lavish life style. This highly learned & pious Dasturji had not only supported but had also personally performed the famous “Mazgaon Navjotes of 1882” of people born of inter-married parentage. In 1882, a group of poor dock workers living and working in Mazgaon Docks appealed to various Priests & High Priests and also petitioned the Bombay Parsi Panchayet ( BPP ) for being admitted to the Parsi fold, as being born of inter-married parentage. Not waiting for the Panchayet to decide, about 200 prominent Parsis collected funds and eminent Dasturjis performed the Navjote ceremony, in the presence of a large gathering on 26th June 1882 . On 26th June 1882, eleven navjotes were performed (4 males & 5 females, age ranging from 35 years to 77 years & two children) on persons born of inter-married parentage by eminent priests including Saint Dasturji Kukadaru Saheb. (Attached are the scanned details with regards to the “Mazgaon Navjote of 1882” in Gujarati). What does the BPP & Wapiz have to say about these Navjotes? Are they going to ban the portraits of Saint Dasturji Kukadaru Saheb? Are they going to denounce him? Are the so called orthodox going to censure, criticize, condemn, castigate, denounce and deflock Saint Dasturji Kukadaru? Do our present day dasturjis consider themselves more knowledgeable and pious than Saint Dasturji Kukadaru? Do the BPP trustees consider Saint Dasturji Kukadaru a renegade priest? Please ask the aforesaid questions to the BPP trustees, the WAPIZ trustees, the so called orthodox Dasturs, and others who have twisted the religion to suit their political agenda. Please also note that these Navjotes were performed on persons in the age group of 35 years to 77 years, and were performed under the leadership of Dasturji Kukadaru and Dasturji JamaspAsa (High priest of the Anjuman Atash Behram, Mumbai). We all know that Dasturji JamaspAsa had in a letter in 1903 addressed to the BPP clearly opined that there is no religious bar on accepting a Juddin into Zoroastranism. What we can summarize from this is that unlike the present day Dasturs, the Dasturs of yester years stood for the truth. We are all aware that Dasturji Kukadaru was a divine healer, a Zarthushti Scholar, and an able and pious Panthaky. Even today many of us continue to be blessed with Saint Dasturji Kukadaru’s vision and healing touch. The present day self appointed Scholars are dwarfs before this wonderful man of Ahura Mazda. View the attached scanned details of the famous "Mazgaon Navjotes of 1882" in Gujarati. Dear all. Let me make one thing clear, I am not siding the orthodox, but this article is ambiguous in the sense that one cannot confirm as to from which side of the linage is the child a juddin, father or mother. If it is from the mothers side, nothing new in it. but if the father is a juddin and the navjotes were performed, credit to those mobed sahebs. Wonderful and intelligent words Mr. Homee Dalal. I wish the contemporary Parsees and more so ever the members of WAPIZ are able to understand your language. It is shameful that in our most educated community we have dumb people who just can’t understand the games played by the BPP trustees.